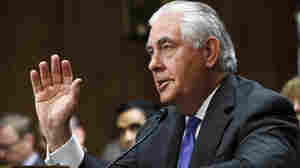 July 26, 2017  The State Department is dismissing rumors of a "Rexit," saying Rex Tillerson has no plans to resign and has a lot of work ahead redesigning America's oldest cabinet agency. July 26, 2017  The Trump administration says it is redoubling efforts to free American citizens detained in Iran. 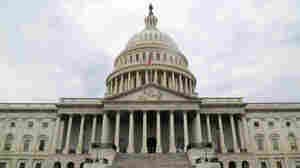 Iran seems to be hinting it wants another prisoner swap, as the Obama administration negotiated. July 21, 2017  The move comes after the death of American Otto Warmbier, who spent a year and a half in a North Korean jail only to return home in a coma. June 30, 2017  The rivalry between Saudi Arabia and Qatar is the biggest test yet of Secretary of State Rex Tillerson. He has deep ties to Qatar's leaders, but the White House seems to prefer the Saudis. June 29, 2017  The State Department is spelling out plans for cutting back on refugee resettlement as a result of the Supreme Court's ruling this week on the travel ban. 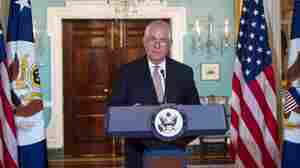 June 27, 2017  Secretary of State Rex Tillerson released the annual Trafficking in Persons Report at a time when critics warn that U.S. budget cuts will undermine efforts to end modern day slavery. 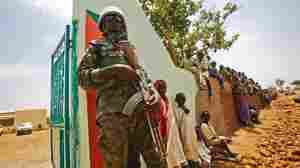 June 27, 2017  The Trump administration must decide by July 12 whether to continue the Obama administration's approach to Sudan, sanctions relief in return for ceasefires and humanitarian access to war-torn regions. June 20, 2017  Ukraine's president is in Washington hoping to meet President Trump and explain his side of the war with Russian-backed separatists, but the White House isn't exactly rolling out the red carpet. June 20, 2017  Ukraine is concerned about what the Trump administration's efforts to improve relations with Russia will mean for its relations with Washington. 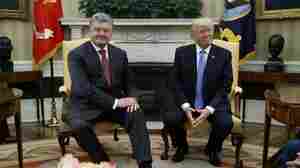 Poroshenko wanted to meet with Trump before Putin did. June 15, 2017  Washington, D.C., authorities announced charges against members of Turkish President Recep Tayyip Erdogan's security detail who allegedly attacked protesters outside the Turkish embassy last month. June 15, 2017  Secretary of State Rex Tillerson wants flexibility as he tries to improve ties with Russia. The Senate wants to make sure the Trump administration doesn't change course without congressional buy-in. June 9, 2017  While Secretary of State Rex Tillerson attempted to heal a deep rift among Arab partners with a carefully crafted statement, Trump called out Qatar for its "very high level" of terror financing.